April 2011 saw 3,249 high rise sales. That’s the best sales total for the month of April ever. And those 3,249 sales represent the third best month ever. As you can see from the above chart it’s right behind the 3,345 sales of October 2010 and the 3,556 sales of June 2007. 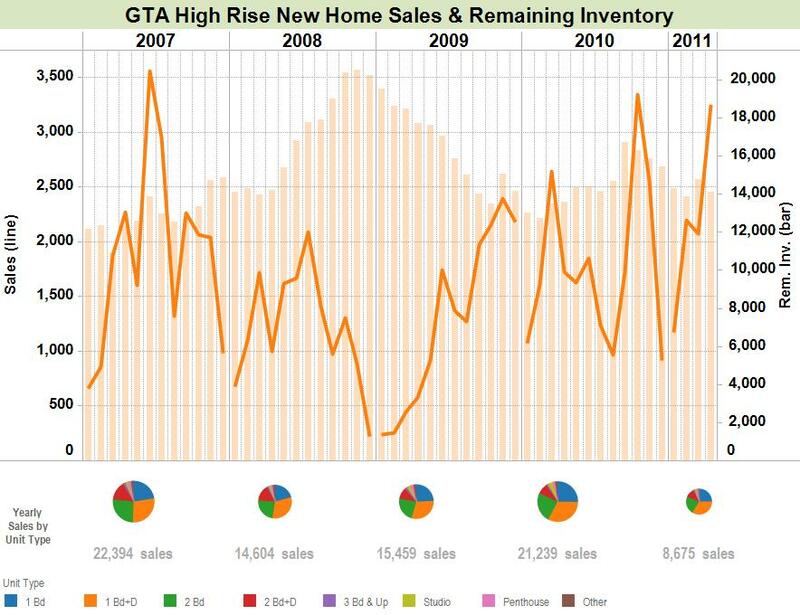 2007 still sets the high water mark for high rise new home sales in a year, with 2010 a close second. April 2011 high rise sales were up 57% from March, and up 89% from the same month a year earlier. Remaining inventory at the end of April 2011 was 14,124 units. Down 4.3% from a month earlier and up 3.9% from April 2010 and still well below the previous peaks of late 2010 and late 2008. This despite almost 30,000 units of new supply coming on the market in the last 16 months.